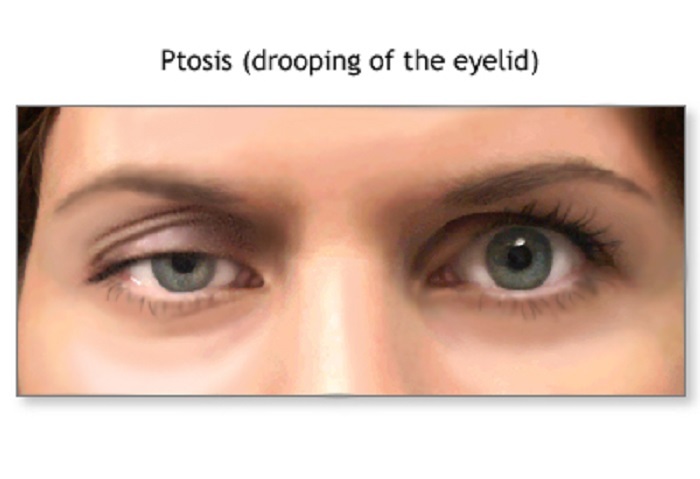 Ptosis has been reported after cataract, corneal, refractive (like Lasik), and glaucoma surgery. Experts aren't sure exactly why this is, though the types of instruments and anesthesia used by the surgeons may play a role. This rare autoimmune disease affects the way your muscles and nerves communicate, leading to muscle weakness. In myasthenia gravis, antibodies (proteins) that normally fight legitimate invaders like viruses misfire and prevent muscle cells from receiving messages sent by the nerve cells. Drooping eyelids are often an early symptom of the condition. The disease can affect other areas of your body, too. There’s no cure, but lifestyle changes and medications can keep associated muscle weakness under control. Although tumors inside your eye aren’t going to affect the eyelid, cancer around or outside the eye can affect the muscles that raise and lower your eyelids. This includes tumors anywhere along the nerves or along the arteries that supply the eye, or in the muscles controlling your eye. Ptosis can also–rarely–be a symptom of metastatic cancer, like breast cancerthis link opens in a new tab or lung cancerthis link opens in a new tab. Contact an ophthalmologist whenever you notice something wrong with your eyelids, especially if it develops quickly over a few days or hours and is accompanied by other symptoms like weakness in your arms, legs, or face; a serious headache; or double vision. If you have ptosis caused by an underlying condition (such as myasthenia gravis), that condition should be treated. Usually, this will improve or at least stabilize the drooping. Otherwise, a droopy eyelid is typically treated surgically. The surgeon will adjust, strengthen, or even reattach the muscle that controls the eyelid's movement. The procedure is done with local anesthetic, and you can go home the same day.